A week or so ago I found myself in downtown Santa Cruz with some time on my hands. My befuddled brain had misunderstood when I was supposed to appear for a doctor's appointment, and I needed to wait for the consultation, to find out if my stuffed respiratory passages genuinely heralded the onset of pneumonia, or if the disease from which I was suffering just felt like pneumonia. I decided to rest my aching body in the quiet confines of the cheerful courtyard maintained by the Hidden Peak Teahouse, about which I had heard many good things, but which I had never visited. Tea would be excellent, I thought. Liquids are indicated for the kind of sickness I was feeling, and I thought that a soothing and contemplative sojourn in the quiet courtyard of the teahouse, just steps from the doctor's office, would be exactly what I needed. I could check my email on my iPhone, while I waited. The staff was helpful and attentive, and the tea was really good. However, I was asked politely, but extremely firmly, to turn off my cell phone. 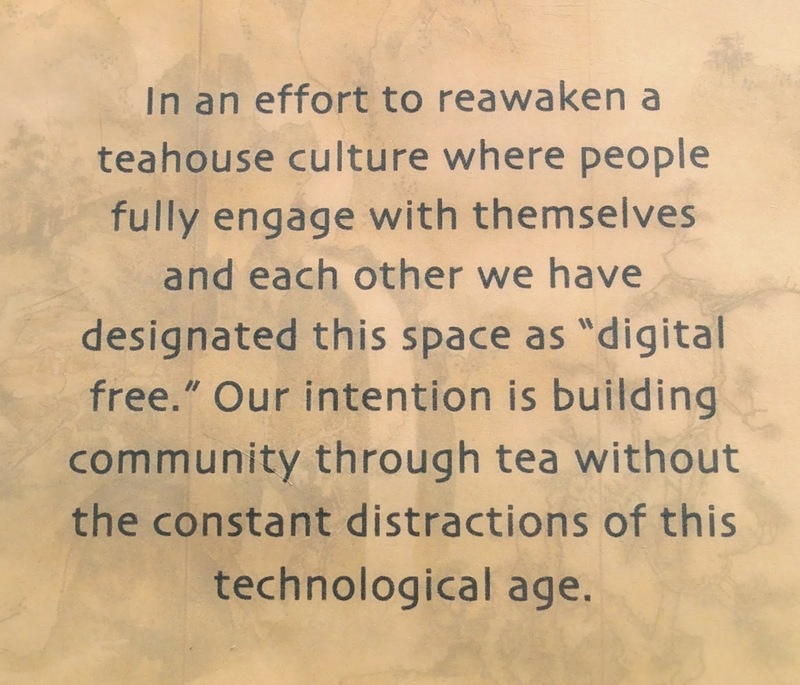 The Hidden Peak Teahouse is a "digital free space." We do live, most immediately, in a world that we construct ourselves, even though this world of ours is ultimately dependent on the World of Nature. In recent times, our human world-building efforts have progressed to a kind of "meta" level, and we live increasingly in a "digital" world of human construction, contained within the real, physical human world, and still ultimately contained within the World of Nature. 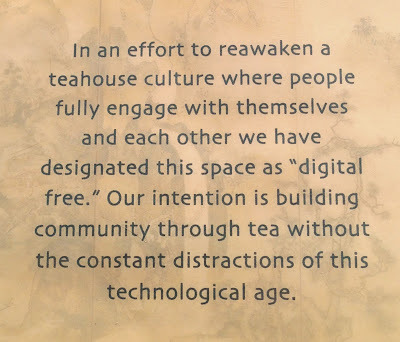 The proprietors of the Hidden Peak Teahouse would like patrons to become reacquainted with that "real" human world, and to eschew, if only briefly, the "digital world" that increasingly seems to many of us to be more real than reality. Upon receiving an instruction to shut down my digital conduits to everything I most value, I first bridled at the unexpected, and unexpectedly firm, request. However, as tea was poured, I moved from resentment to acceptance. I could get used to doing this. In fact, I think I recommend it! 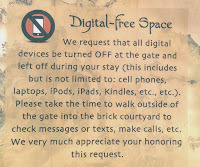 What a delight to learn of a digital free space, in downtown Santa Cruz no less. We shall try it at our earliest convenience. Thank, Gary, for sharing the jewel (and I hope you have mended well from your respiratory problem). What a shame that children especially have no place where they can be alone with their own thoughts in this Life of the Digital Age. I think of Arana Gulch as I write this, since the City promoted plans to have digital educational stations installed throughout the greenbelt (once a natural area) for iPods so children can listen to the sound of resident birds. What is wrong with this picture?! Digital birds? What doesn't sound quite right about that! !